The Traditional Territory Stewardship function of the Lands & Resources Department helps to ensure the appropriate use of the 781,131 ha of Líl̓wat Traditional Territory. Using a framework that considers the Líl̓wat Land Use Plan and archaeological, environmental and cultural impact assessments, the Lands & Resources Department examines all proposed new land use within the Traditional Territory. When needed, the department carries out fieldwork and further studies. The goal of the Lands & Resources Department is to ensure the Líl̓wat Nation Title and Rights throughout its Traditional Territory are recognized and protected, and that land use decisions reflect the core Líl̓wat belief that the land and people are together as one. Guided by the Líl̓wat Nation Strategic Plan, the Land Use Referral Consultation Policy and a five-member, community-based Land Use Referral Committee, the department assesses all proposed new land and water tenure, license and permit applications using an evaluation process built on best practices. 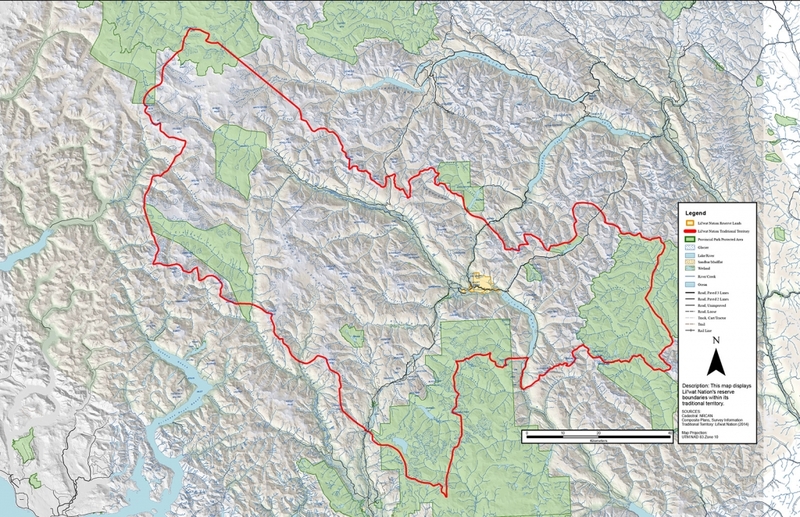 The Líl̓wat Nation Traditional Territory extends Rubble Creek, north to Gates Lake, east to the Upper Stein Valley and west to the coastal inlets of the Pacific Ocean. At 797,131 ha, the Nation’s traditional territory is approximately one-quarter of the size of Vancouver Island and features a rich diversity of natural resources. The goal of the Lands & Resources Department is to ensure the Líl̓wat Nation Rights and Title throughout its Traditional Territory are recognized and protected, and that land use decisions reflect the core Líl̓wat belief that the land and people are together as one. Guided by the Líl̓wat Nation Strategic Plan, the Land Use Referral Consultation Policy and a five-member, community-based Land Use Referral Committee, the department assesses all proposed new land and water tenure, license and permit applications using an evaluation process built on best practices. Líl̓wat Nation Traditional Territory maps can be ordered from Lands & Resources. Maximum custom map size is 132 cm x 86 cm (52” x 24”) with full-colour maps available in sizes up to 112 cm x 86 cm. To order a map or receive a quote, please call the Lands & Resources Department at 604-894-6115. The land and Resources Department conducts Cultural Heritage Research in conjunction with professional archeologists and anthropologists. Research is guided by the in-house expertise of our Cultural technicians, and with the approvals as needed from the Líl̓wat Cultural Heritage Language Authority. Líl̓wat Nation cultural artifacts, including pictographs, culturally modified trees, s7ístken (pit houses) and stone bowls dating back more than 5,000 years, have been found throughout Líl̓wat Traditional Territory. To preserve archeologically important sites, the Lands & Resources Department executes Archeological Assessments for prospective development sites. Any archaeological sites found are then registered for protection under the British Columbia Heritage Conservation Act. Traditional Use Studies identify places of cultural importance and through documentary research, fieldwork and interviews determine past, present, and potential future traditional land use values. Over the years numerous Traditional Land Use Studies have been completed preserving valuable cultural knowledge. Every year, the Lands & Resources Department receives more than 75 Crown Land use referral letters from provincial, federal and local governments, as well as private companies. The referral letters may be regarding proposed development projects for forestry operations, independent power projects, or commercial recreation activities. The Crown (defined as both provincial and federal governments) has a legal obligation to consult with the Líl̓wat Nation regarding any proposed new land use within Traditional Territory. With the assistance of a five-member, community-based Land Use Referrals Committee, the Lands & Resources Department employs a process for responding to referrals that is laid out in the Líl̓wat Nation Land Use Referral Consultation Policy. High priority referrals are taken to Chiefs and Council. The Lands and Resources Department engages in consultations regarding a variety of proposed new land development projects, including forestry cut blocks, run-of-river hydro projects, trail developments and commercial recreation activities. The department also reviews and provides input on provincial policies and regulations regarding old growth forest management areas, wildlife habitat areas, riparian protection zones, and protected area management plans. The referral consultation process leads to opportunities to negotiate Impact Benefit Agreements with companies seeking to obtain land or water use tenures within Líl̓wat Traditional Territory. These agreements are negotiated under the direction of Chief and Council and seek to secure benefits for the Líl̓wat Nation in lieu of supporting a proposed project. Impact Benefit Agreements may include revenue sharing, equity (ownership) in the project, commitments to employ community members, and contributions to community endowment funds. As well, commitments to Líl̓wat environmental monitoring may be negotiated, as was that case with Upper Lillooet Independent Power Project. The Líl̓wat Nation and BC Parks will be working over the next year to develop the Nlháxten/Cerise Conservancy Management Plan. This strategy will be used to guide forestry planning to minimize impacts on culturally important plants. Líl̓wat Forestry Ventures is currently working with the Land and Resources Department to spearhead the implementation of this new Botanical Resources Strategy. Líl̓wat Nation is currently working in partnership with the Province and Coast to Cascade Grizzly Bear Initiative to develop a plan to reduce the impacts of motorized activities on important Grizzly Bear habitat areas within the Líl̓wat Nation Traditional Territory.